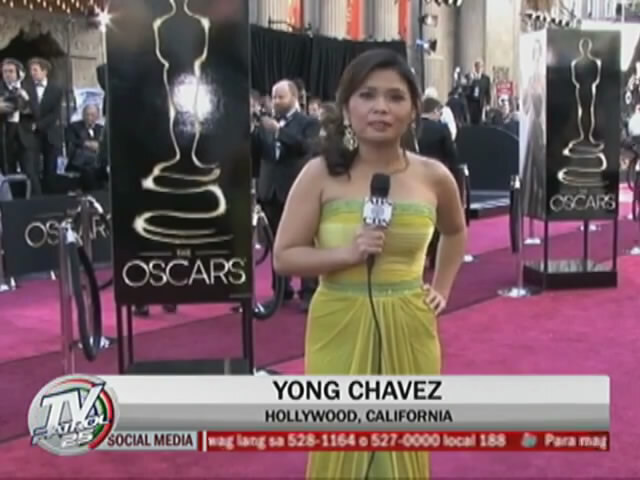 ABS-CBN News' Yong Chavez made history this week as the first Filipino TV reporter to cover the Academy Awards. Never in the history of Philippine TV that a local reporter got a chance to cover the Oscars live from the red carpet and interview the likes of Aaron Tveit and Ang Lee among others. This year, Chavez broke the mold and represented the country in one of TV's most-watched events. When asked about her experience covering the Oscars, Chavez said that it was tiring but unforgettable. "I still can't believe na yung show na nakikiusap ako sa kapitbahay na panoorin ko dahil wala kaming TV nung bata eh ma-cover ko. Dream come true talaga," she said. Interestingly, while Gretchen Fullido acknowledged Chavez for this history-making coverage, "Sa unang pagkakataon naman ay nakapasok ang Pinoy TV correspondent sa Oscars red carpet," Boy Abunda didn't even mention anything about this significant milestone during his "Trending Balita" segment on Bandila. Insert hashtag, #givecreditwherecreditisdue.